A view of some of the booths at the 2012 Chicago Christkindlmarket. 11 months out of the year Daley Plaza is just a concrete slab of public space but it’s beginning to look a lot like Christmas down in the loop thanks to a German Christmas festival called the Christkindlmarket. The Christkindlmarket is a tradition that originates from Nuremberg, Germany dating back to the 16th century. The German American Chamber of Commerce of the Midwest brought the festival to Chicago in hopes to help trade between Germany and the US in 1996. Woodstock High School German teacher Jeff Walsdorf has been bringing his classes to the Christkindlmarket for the past 7 years. He has been to markets held in Germany and says that Chicago has done well reproducing the event overseas. “The Chicago market is a wonderful reproduction. So much so that I get excited to go each year. I can say without reservation that it smells the same, looks the same and sounds the same. The group which organizes the market has done a great job,” Walsdorf said. This year there are over 50 vendors that sell authentic clothing, music CDs, accessories and ornaments, the market has a house where children can visit Santa Claus and tell them their Christmas lists. Although the Christkindlmarket is a German festival at heart, many of the booths are actually from all over the world. A list of this year’s non-food vendors is provided on the Christkindlmarket’s website. Nadie Ojwahjeewa is from Arizona and runs a booth that is completely separate from the German theme of the festival. “The booth is primarily Native American jewelry, artifacts, works of art, pottery. You know, Christmas decorations,” Ojwahjeewa said. Everything that is in Ojwahjeewa’s booth is handmade from tribes in the Southwest region of America. She says that the Navajo have made a majority of the merchandise. Ojwahjeewa says it is her first year with a booth at the festival but it was easier than she thought to be able to be a part of it. “We actually knew about the German festival for some years and we applied and they accepted us to be as part of their German festival this year,” she said. Ojwahjeewa said that business has been great for her. She thinks the idea of an ethnic festival that features booths from all over gives all types of people a chance to find out more about their heritage. “A lot of people were connecting, finding their connection to different backgrounds. You know, where they came from. It’s been great to see,” she said. Walsdorf hopes that each year his students can find that connection as well. “I bring the students there because it provides an immersion experience they won’t find elsewhere in the Midwest,” he said. For too many of them it will be the closest they get to actually being in Germany. The historical lessons are important for this festival but Walsdorf says the food is a favorite component. Chicago natives Paula and Jeff are veterans of the Christkindlmarket and loved returning each year to experience the atmosphere. “We’re enjoying the beautiful weather, we wanted to taste some authentic food indigenous of their regions other than hotdogs,” Jeff said. Most of the food vendors sell typical German food like bratwurst, potato pancakes and leberkäse which is a meat mixture of pork, corned beef, bacon and onions. Paula and Jeff have some favorites of their own. The spiced wine or glühwein is heated, red wine that is spiced with cinnamon, cloves, citrus flavors, sugar and sometimes vanilla. Customers can buy the glühwein in a normal cup or, at a higher cost, in a decorated ceramic boot that was made in Germany to use as a souvenir. Walsdorf shared his thoughts that the Christkindlmarket adds to the diversity of the city of Chicago and shed lights on the German culture. “If the intent of the festival organizers was to positively affect the appeal of Germans and Germany than it is by all means a success,” said Walsdorf. 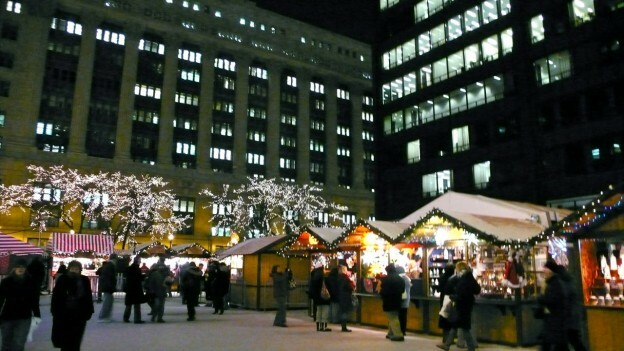 The Christkindlmarket will be open on weekdays from 11 AM until 8 PM and weekends from 11 AM until 9 PM throughDecember 24th, 2012. Here is more information and footage from this year’s Christkindlmarket.